Throwing a punch is a complex series of movements that begins in your feet and ends with your knuckles striking a target. 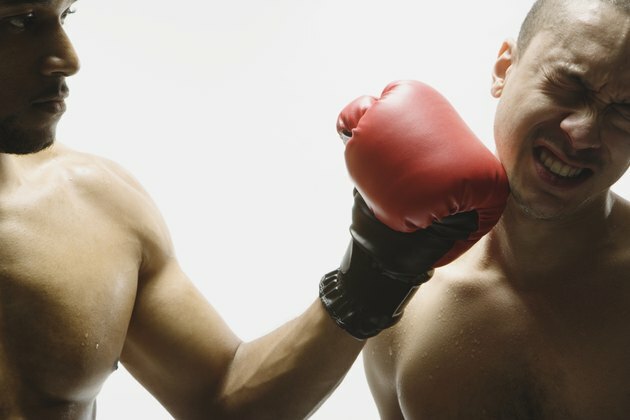 Boxing uses every muscle in your body but some are more active than others. The most active muscles are the ones that will become stronger as a result of regular boxing workouts. Training with a sparring partner or hitting a punching bag will result in similar strength improvements in the major punching muscles. The largest muscles used in boxing are the pectoralis major or pecs for short. Located in your chest and spanning from your sternum, clavicles and lower ribs to your humerus or upper arm, the pecs are powerful muscles responsible for much of the force of your punches. The pecs are most active in punches where the elbow is elevated, such as during the hook, but are also strongly involved in all of the other punches. Boxing will make your pecs stronger. You have three major shoulder muscles: the posterior deltoid, medial deltoid and anterior deltoid. In boxing, the most active shoulder muscle is the anterior deltoid, which is located on the front of your shoulder. The anterior deltoid works with your pecs in a synergistic fashion to maximize the force of your punches. The medial delt is active every time an arm is lifted for a right cross or a left hook. The rear deltoids are active whenever you pull your arm back from punching. Keeping your hands up in a guarded position requires and develops strong deltoids. These are the muscles that tend to feel most fatigued during a long bout of sparing or bag work. Located on the rear of your upper arm, the triceps brachii is responsible for snapping your elbow straight as you deliver a punch. Usually referred to as the triceps, this muscle is essential for continuing the momentum generated by your anterior deltoids and pecs and driving your fist towards your intended target. The biceps are active the entire time you box as you hold your hands up in your guard. All types of punches will help strengthen these muscles, however, they are most active when you are striking a heavy target as opposed to shadow boxing. Successfully throwing punches and protecting yourself from the punches of your opponent requires a strong core. "Core" is the collective term used to describe your abdominal, waist and lower back muscles. A well-thrown punch involves a significant degree of spinal rotation and flexion; it is this action that provides a significant challenge for your core. Taking punches to the midsection will also strengthen your core muscles. In your back, your traps, rhomboids and rear deltoids are activated every time a punch is retracted. Boxers are moving constantly. Footwork is one of the primary tools in boxing and the quads, hamstrings and calves are never at rest. Quads and glutes come into play whenever a boxer slips or rolls under or around a punch. Any punching also starts all the way down in the feet and the torque is transferred from the legs, through the core and out the arm. What Parts of the Body Does Boxing Work? When Punching a Boxing Bag, What Muscles Are You Using? Will I Build Muscle If I Use a Punching Bag?